Cousin Verdine who lives on Maui knocked on the studio door yesterday for a surprise visit. 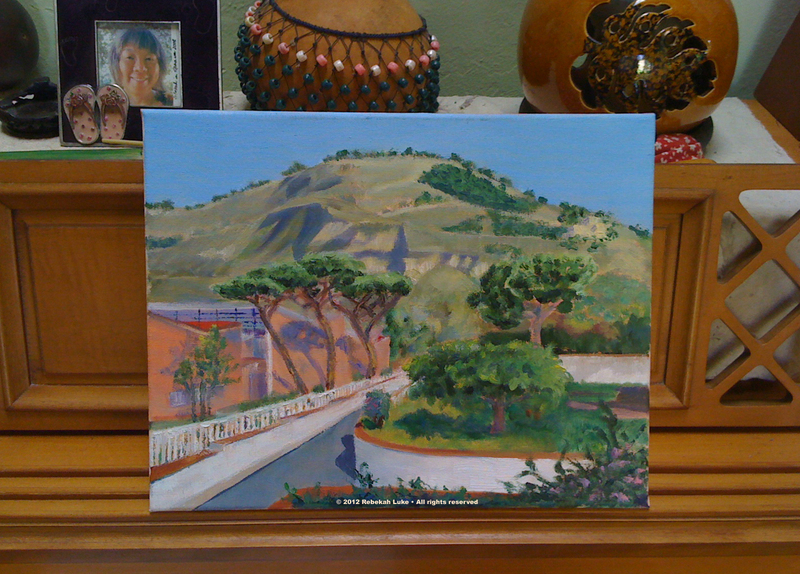 I havenʻt see her since we traveled to Italy together—at least thatʻs my recollection; and this morning Susie, who is going to Italy to paint soon, asked for some travel tips. She is going to some of the same places DH and I went to. That led me to point her to my travel blog, Popo Goes To Italy. I was reminded that the first reason I keep a blog is I write for myself. It is a way for me to document my experiences, and then read about them later, if I wish. Case in point: I had forgotten all the lovely details about Italy, until I just read about them again. Oh, how I miss Italy! 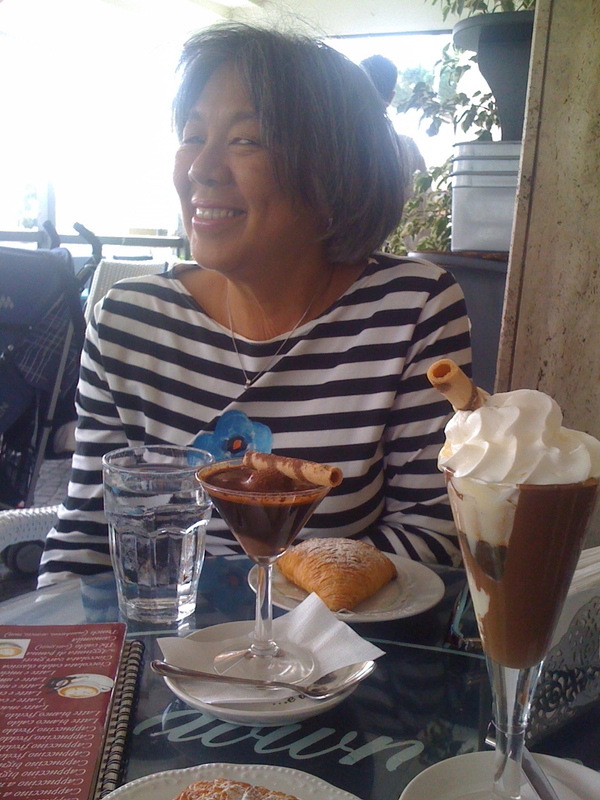 At Up and Down Caffē bar in Arco Felice, Campania. My time in Italy was productive! I made two oil paintings, influenced by the style of Tuscan artist/teacher Agostino Veroni. What do you think? My students and I learned some time-saving techniques. 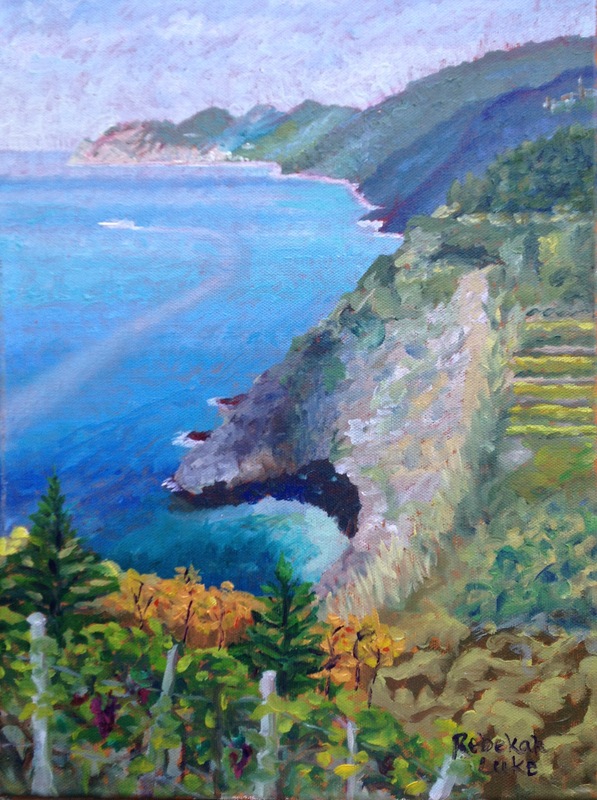 Of course, while Veroni takes only 2-1/2 hours to make a painting start to finish, I took a little longer, but not much more than a day for each. If you didn’t have time to follow me in Italy, my reports are still up at Popo Goes to Italy. 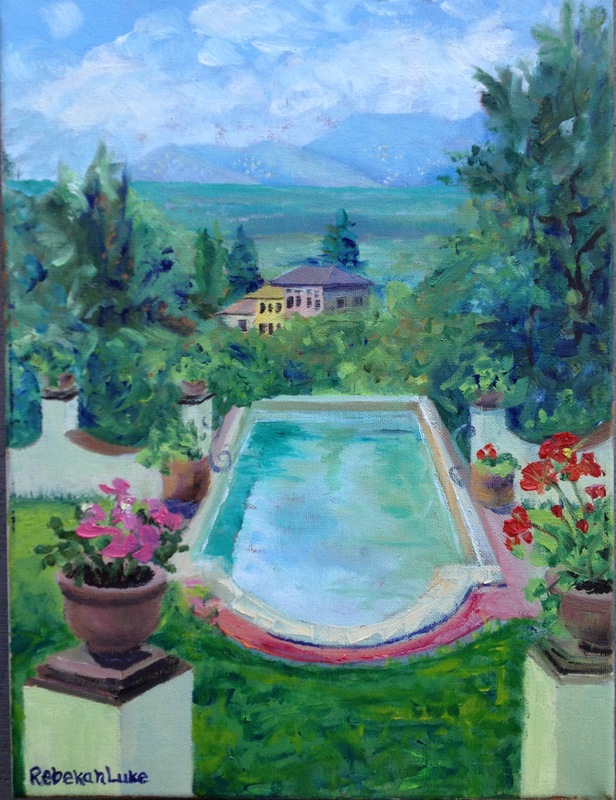 There are several posts about the painting experience abroad. Have a wonderful day! Thanks for coming with me to Italy! I’m here at the studio now, getting back in the groove. If you missed my adventure, you can see it at “Popo Goes to Italy,” though it will be in reverse chronological order. I just posted the final entry at that site. I really saw and did a lot! While in Italy, I found some time to paint in oil. I shipped some supplies ahead for convenience, unsure if I could get them at my destination. As it turned out, the frame shop at commissary at which I had privileges through our son-in-law was well stocked. 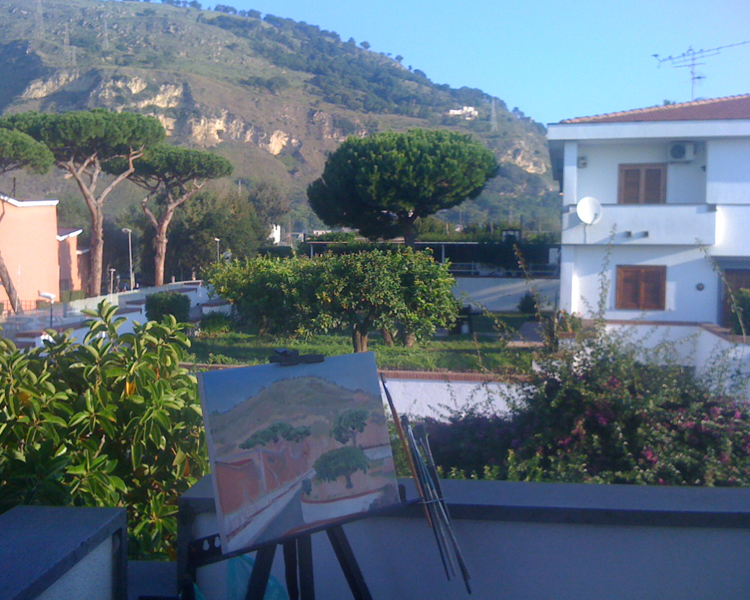 This is the view from the house, at the foot of Campiglione. Inside the crater is a large recreation area for US Armed Forces personnel and their families. DH and I went there several times with Miss Marvelous and her family. My set up. Painting is unfinished. 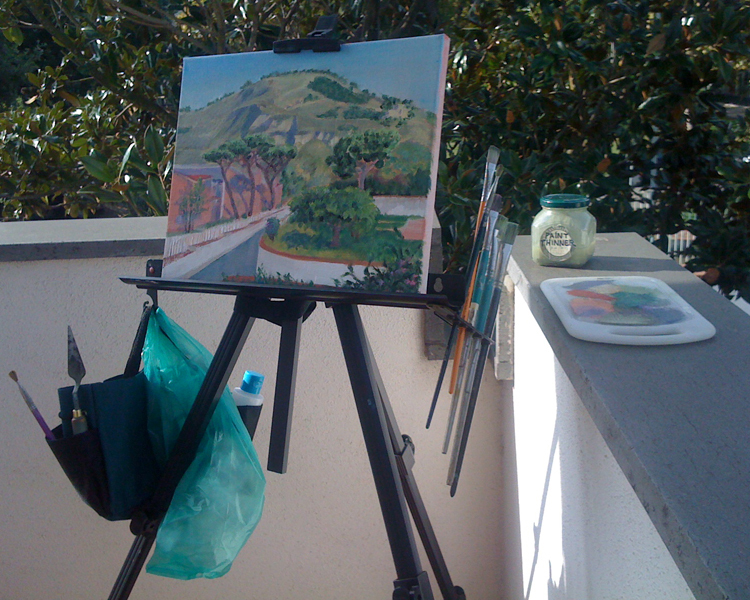 En plein air. My view from the balcony. 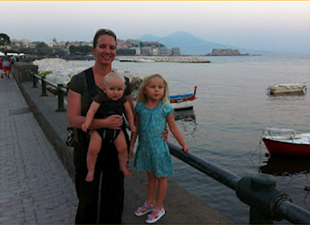 Our son-in-law Travis landed a job rotation in Naples, Italy. 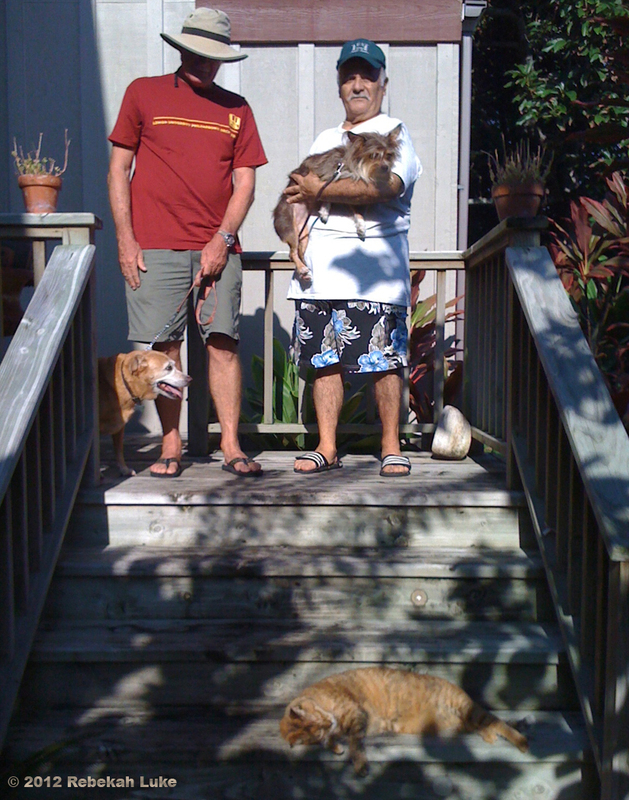 Yes, it’s true: in less than two weeks he and DH’s only child Ari and their children Miss Marvelous and three-month-old Perrin leave Oahu for three years. Our family and close friends have got used to the idea and the many advantages of moving half way around the world from Hawaii. Travis is a civilian who will be working for the U.S. Navy that has a large base in Naples. His expertise is in water engineering. There will be better pay, proximity to all of Europe, international school for Miss Marvelous, and many other benefits, including a generous housing allowance, for this young family. What they leave behind will likely still be here when they return. Culture shock, most likely. And their dog Pua, who will not make the trip but will move in to live with us instead. Poor Ula! Aloha, ciao, hello, good-bye, but mostly good luck and see you again soon! DH and I hosted a going-away party on Saturday at our house and invited some old friends, neighbors, and people in our rural Kaaawa town who Ari grew up with. The guest list included our little friend Oliver, a playmate for Miss Marvelous. Flooding and road closures of the severe weather storm the previous five to six days—with chilly air, a tornado, thunder, lightning, and hail stones— were not a problem anymore, thankfully, and all the folks, almost 40 of them, arrived and stayed ’til the end. It’s not uncommon for us to schedule a party, only to have stormy weather on the day of the event. Go figure. 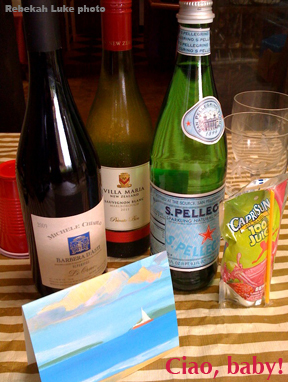 I planned three food stations (hot food, cold food, and beverages) and a simple-to-prepare, mostly Italian menu. The only item I had to actually cook was the mushroom risotto that I precooked the day before following instructions from Queer Eye for the Straight Guy (Clarkson Potter/Publishers, 2004; ISBN 1-4000-5446-X). The rest involved finding space in the refrigerator and freezer, and washing the produce: Palermo’s ultra-thin crust Margherita pizza (frozen, three to a box from Costco), sushi (1 big platter made to order at the last minute from the Ninja Sushi store), fresh romaine, bocconcini (small, marinated mozzarella balls, 40 to a tub from Costco), fresh tomatoes (found some cute, flavorful, 1-1/2″ ones that I sliced in half and drizzled with bocconcini marinade), steak (broiled to rare and sliced for serving so diners didn’t need a knife; the meat continued to cook on a steam table), roasted asparagus (with a little olive oil, salt, pepper, 500 degrees F. for 5 minutes), and brownies (baked in the morning from a Ghirardelli mix). I brought out the nice stem glasses for the Italian wine—hey, what better occasion? !—and, although we didn’t request that people bring anything, they did. No one got thirsty. 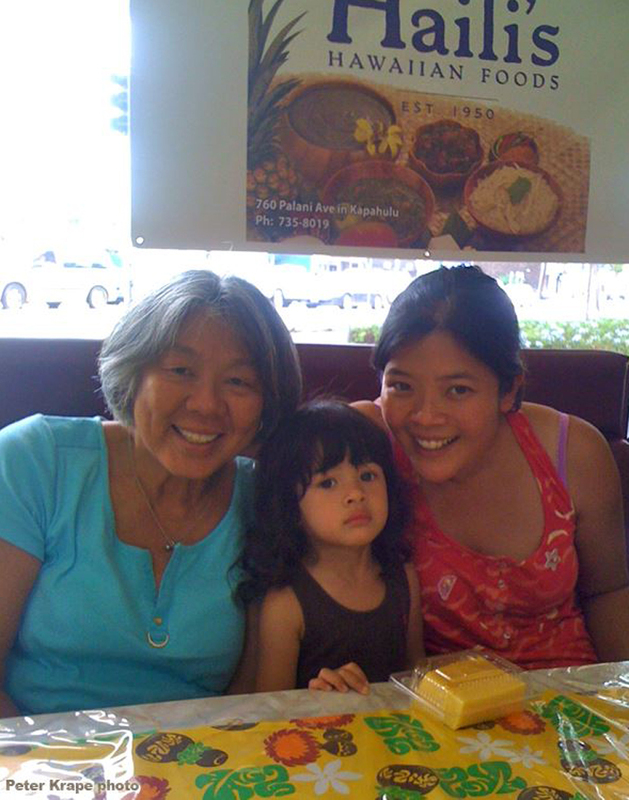 Ari brought Bubbie’s mochi ice cream from Miss Marvelous’s school fundraising event. Ari loves mochi. I wonder if they have mochi in Italy? Of course, we have to visit the kids in Italy! They announced they will come back home to Hawaii in November for Perrin’s first birthday luau. Kalua pig from the imu and the works. Hearing that, this big change in our family is easier for Papa (DH) and Popo (me) to take. Ciao, baby! See you on Skype!